Last week the School Board approved adding two eLearning days to the 2014-2015 school calendar. October 31 is the first day and is for all students with the second day for students in grades 9-12 only and held on May 4. During the October 31 eLearning day, teachers will be involved in professional development activities at ENHS. There is much planning that needs to be done between now and October 31 for a productive and valuable eLearning day for our students. Teachers of K-6 students will be involved in grade level meetings in the next few weeks and will have an opportunity to discuss and plan lessons/activities. As a district approved by the IDOE for eLearning days, ENSC will also be approved to use eLearning days for weather cancellations. We will take advantage of this opportunity; however, we will use our built in days first and it will also depend upon the number of days cancelled. Essentially, using eLearning days is not our first "go to." With all of that said, consider the October 31 as a "practice" for eLearning days. In addition to the eLearning days being added to the calendar, the Class of 2015 graduation is set for Sunday, June 7. With the use of eLearning days and built in snow days, we do anticipate holding graduation on this date! On Friday, school grades were released across the state (not to the media). As a district, we had schools that improved their grade and schools whose grades dropped. For the past few years, we have seen incremental growth, while not stellar, there was growth. Unfortunately, we cannot say the same for the 2014 scores. As a result, the district dropped their grade. It is unfortunate that there is so much emphasis on a once a year high stakes test that covers primarily language arts and math with some weight to social studies and science. ENSC believes strongly in providing opportunities for students and serving the whole child. Strong language arts and math skills are extremely important in career and college success; however, exposure to the "real world" and expectations for success in that real world go beyond the areas tested by the ISTEP and ECA tests. it is our responsibility to provide a quality education that meets the diverse needs of our students. ENSC will continue to regularly assess our students, provide support to close the achievement gaps, expose students to multiple opportunities that help them plan for their future, and also prepare them for the annual test. I know that the teachers of ENSC work very hard to meet the needs of our students and at the same time, I also know we will not take these test results lightly! How did the proposed middle school project go from $24-$25 million as stated last fall to $37.8 million? This week’s All-Stars are South Side’s Dynamic Duo of the main office: Deb Hursey and Sherry Kemerly, our Secretary/Treasurer and Office Assistant! These two ladies are the heartbeat of our building—supporting our staff, families, and students with their calm and pleasant demeanor and confident professionalism. They are not only our secretaries, but also our business managers, customer service representatives, nurses, accountants, social workers, purchasing agents, counselors, personnel managers, maintenance coordinators, surrogate mothers and grandmothers, event planners, and more. Deb and Sherry share a close workspace, and their working relationship is equally close. Not only do they support our staff, but they support each other—sharing duties, covering the office, and working together to effectively and efficiently troubleshoot issues that arise on a daily basis. When administration is out of the building, our staff, students, and families are in kind, caring, and extremely capable hands. We are very fortunate to have Deb and Sherry with us at South Side. 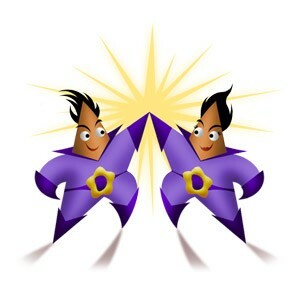 They are truly among our All-Stars! South Side’s grade level update this week comes from our Kindergarten classes! In Kindergarten, we have been working on many different and wonderful things. In writing this week, we have created a class rubric for one of the 6 traits and continue to establish procedures in writing. Each Kindergarten class is creating a classroom rule book using photographs of South Side Students. In math, students are learning about shapes. They have been sorting shapes of all kinds. 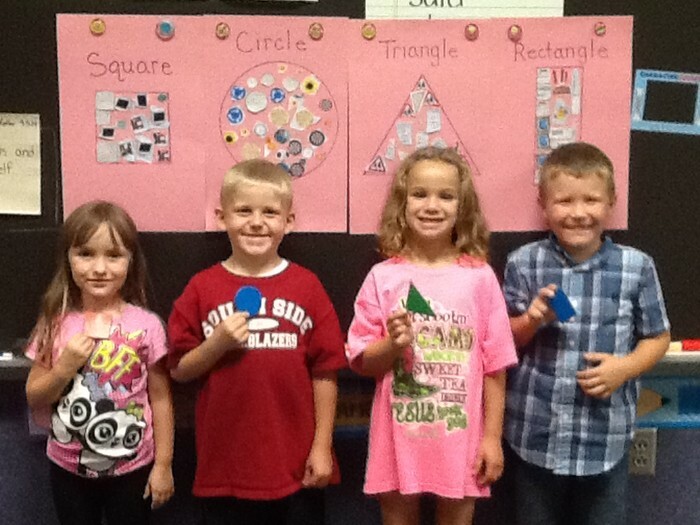 Students learned that shapes can be found everywhere! Kindergarten searched for shapes in magazines as well as in the classroom. They enjoyed looking for and finding shapes everywhere. 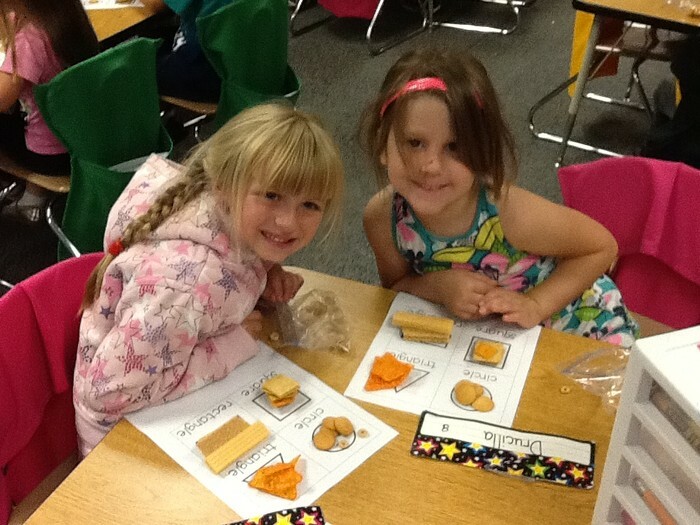 We even had a “Math Snack,” making shapes and finding shapes with the food we eat. In reading, students are learning all about characters and settings. Students are now familiar with the Daily 5 and are on daily reading rotations. They continue to build stamina and independence with Daily 5. Kindergarten students now know fifteen sight words, and that list grows every week! 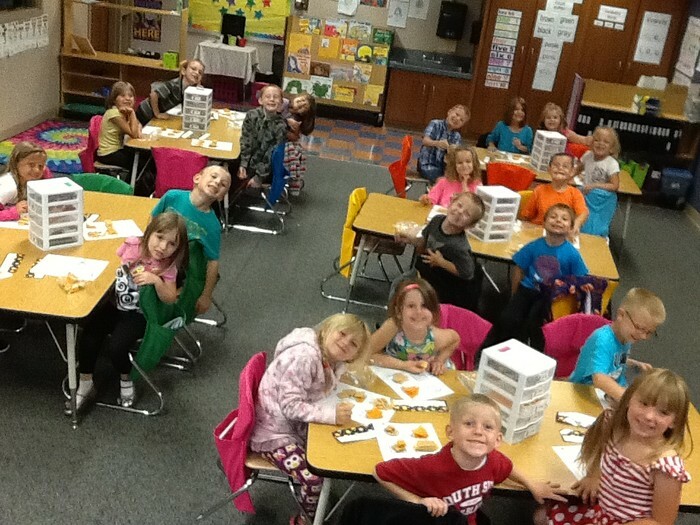 Second graders are working hard at Wayne Center Elementary. The students are working on their positive behavior to be a part of dessert Friday. Any student who is on purple or above all week without moving any magnet gets to eat lunch with their their teacher and get a dessert treat. Second graders also started working with Mrs. Munk from the Kendallville Public Library. Mrs. Munk is working with the students on science related topics. She started by having a discussion on what is science. She followed up that discussion with introducing pushes and pulls, talking about how every push and pull is a force. The second graders are looking forward to working with Mrs. Munk every Wednesday! Lastly, sixth graders and their parents attended a technology meeting Thursday night. During the meeting, tech coach Mr. Yoder quizzed students and parents on digital citizenship through the use of Kahoot. The students raced to answer the questions to see who could earn the most points. All the questions served as a reminder to students of how they can be good digital citizens. Mr. Yoder also demonstrated how parents can access their child’s grades and assignments through PowerSchool and Canvas. The evening ended with some fun door prizes for the students. It was a short, but busy week with earning credits. Several students finished up classes they started at the beginning of the school year and are ready to move on to their next class. The ALC is exploring new choices for electives that are now being offered through Apex (web based academic program), so students will have more options for classes in the near future. Knight's Kloset, EN clothing bank, has picked up with appointments this week, with the cooler weather rolling in. Please continue to make referrals and tell others about this great EN resource! OUR entire third grade is off to a great start this year. They are learning about science and the movement of sound. This week we started on how sound travels to the ear. 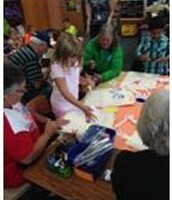 They are doing hands on activities with Miss Leah from the Kendallville Public Library. They are also learning about different cultures with reading fables around the world. A speaker will be coming in shortly to tell a tale about a specific culture with food, music, and a game! The next few weeks will be very busy here at Avilla. 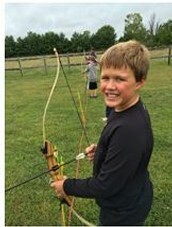 OUR 5th graders will be going to Camp Potawatomi this Wednesday and Thursday. Progress Reports will be sent home with students the week of September 22nd. On September 30th we will be having an anti-bullying convocation. The following day, October 1st, OUR kindergartners through 3rd graders will be traveling to Huntington University for the day and OUR 6th graders will be traveling to BizTown. The Huntington University trip is part of the Noble County Promise. We then will host Grandparent’s Day on October 2nd. We are hoping for another very large crowd that day as in the past. The Algebra 1 classes are off to a great start this year! Algebra 1 is now a module system where students progress through the indicators by showing mastery. Students who do not show mastery are receiving extra remediation help before, after and during Academic Lab with the new Algebra remediation AL classes. Students in Algebra are also practicing CCR standards questions on their computers. Students practice their questions twice a week for their bell work exercises. Students are encouraged to work with their group members and discuss problem solving strategies on how to solve the problem. Students love practicing for the test using the same technology that the test will be given in! Also, Homecoming week is quickly approaching! Homecoming week is September 22-26. Students are very excited about the dress up days, the multiple homecoming activities, and the football game Friday night! It will be an awesome week! Go Knights! Eighth grade students began their water quality field trips this week. It's a great hands-on experience for our students learning about water and what's in it. 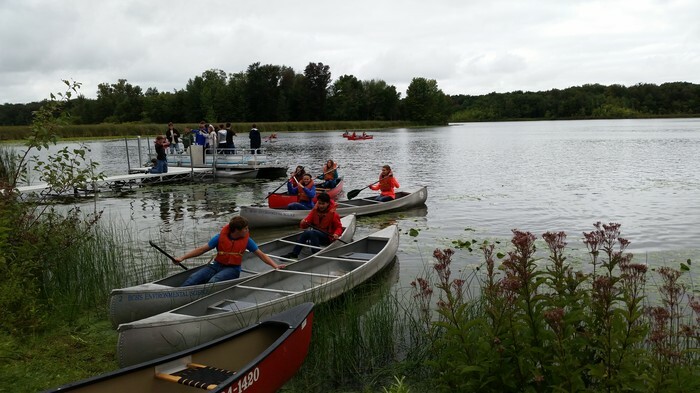 Merry Lea was our stop this week, where students got to canoe, skim water (with waders on!) for macro - organisms, use microscopes to see up close the organisms they found, and learn about testing water quality and temperature. Rachel's Challenge visited ENMS this week. Students experienced a very emotional anti-bully presentation. We have an active Friends of Rachel club that acts as student liasons. Strides are being made in grade improvements. Students will be setting goals soon to reach this year. And students are signing off on a student pledge to Maximize Their Potential every day. The week at North Side began with fourth and fifth graders learning about the hazards of drug abuse. Students worked in groups with local volunteers learning about a variety of dangers and warning signs when it comes to drugs. The evening ended with dinner with their parents and a presentation from a Noble County judge. North Side appreciates all the work and planning that went into the evening by LEAP of Noble County! It was a big week at Rome City Elementary School! The week started with Monday being Grandparent’s Day. At 8:00 a.m. grandparents began arriving for breakfast and by 8:30 we had a total of 132 grandparents at school! After enjoying a morning meal with their students they were invited to visit classrooms. 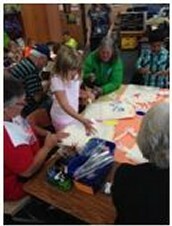 Each classroom planned special activities and treats along with demonstrations for grandparents to experience what we do at school every day. On Thursday Mrs. Scherer and Miss Bolen ventured to the YMCA Camp Potawotami in South Milford. Although the weather was not perfect, the kids still had a great time. 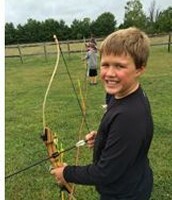 The trip encouraged team building by offering canoeing, hiking, archery, rock climbing, Underground Railroad, and a campfire with entertaining campfire stories. Rome city 6th graders had a large number attend their laptop/parent night. Students and parents learned about digital citizenship alongside one another, as well as proper use of their computers. Parents were also given some refresher information about PowerSchool, and learned new information about Canvas. Parents like the idea of Canvas and the fact that students could do so much on it from home, making it easier for missing work, e-learning days, and assignments from teachers. 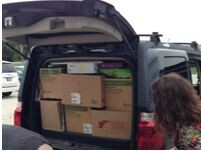 Thanks to the Elkhart Teacher Store, 5 Rome City teachers were able to bring back to school books, paper, and many other wonderful supplies. You never know what you are going to get but it is always worth the trip.